You can see the sign for DeSerres “the Creative Marketplace” reflected in the upper part of The Loop’s storefront. A couple of weeks ago my job took me to Halifax, Nova Scotia, and since we were working the afternoon shift I had time to wander around downtown in the morning. It was fun to be out of my regular routine for a couple of days. (The work was fun too, but that’s not what this blog’s about.) Obviously my art angel was with me because I stumbled upon an art supply store and a yarn shop. Of course I went into both. I was very keen to make another cowl, so I focused my search on yarn. To ensure warmth, it had to have a high wool content. I also wanted the yarn to work on at least 4.5mm needles and not be self-patterning. It didn’t take long for me to zero in on these teal and taupe skeins of Cascade 220 Heathers yarn. 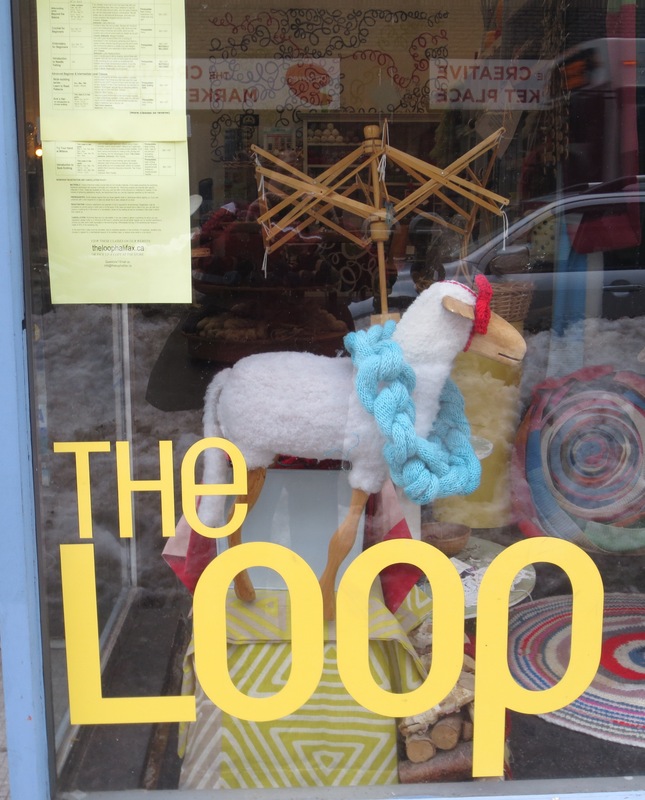 As I was making my purchase, the store clerk asked if I wanted to wind the yarn. At first I said no because I didn’t want to lose half an hour of my morning winding yarn, but I was told it would take only a few minutes. Now that was promising; so much better than sliding the untwisted skein onto a chair back and manually winding it into one massive ball. In no time at all the clerk had me set up on the winding apparatus. 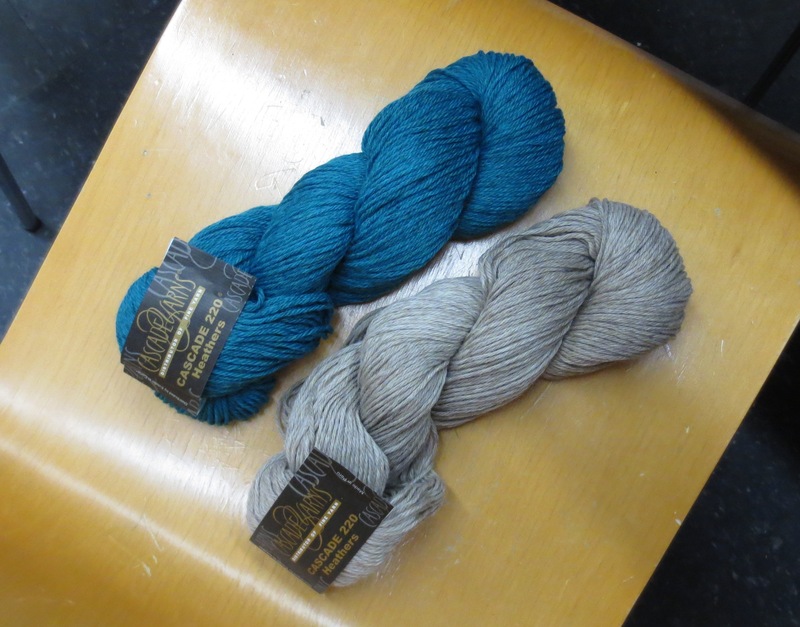 On the left below, you can see where the full skein is loaded onto the “yarn swift”. It looks like an old-fashioned baby gate that’s been shaped into a circle. All I had to do was turn the crank on the ball winder. Boy that thing could fly. Three minutes later, ta-da! Not only did I have a tidy ball of yarn, but I could pull the yarn out through the centre hole. Before and after. 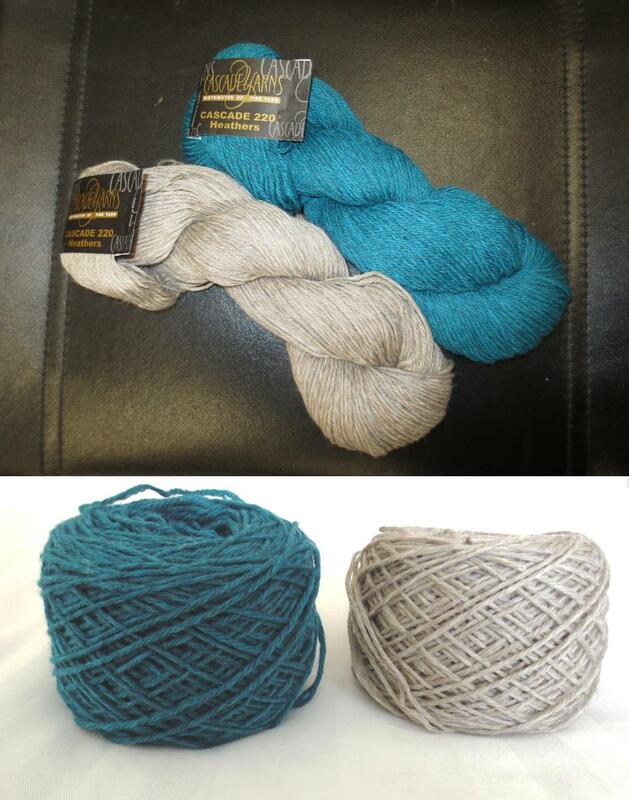 The skeins of yarn as sold by the shop (top), and the quickly wound, neat and functional balls I left the shop with (bottom).